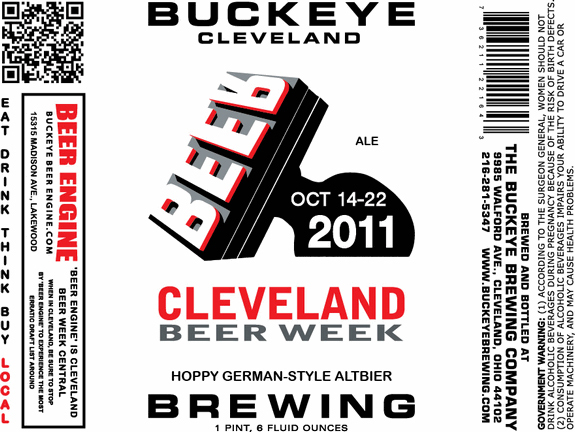 Buckeye Brewing’s Cleveland Beer Week 2011 Beer Unveiled! It’s officially time to start getting excited about October’s Cleveland Beer Week! More news about a release date will be coming soon. If the last few years are any indication, expect to see this beer on the shelves in the next month. It should be available at Heinen’s Supermarkets, on tap at many Cleveland Beer Week events and all over town, wherever better beer is sold. The third annual CLEVELAND BEER WEEK will take place from October 14-22, 2011, and will feature hundreds of craft beer tastings, dinners, demonstrations, leisure activities, educational programs, and specials at bars, restaurants, and grocers throughout Cuyahoga County. Established in 2009 as the first event of its kind in northeast Ohio, CLEVELAND BEER WEEK is a not-for-profit, collaborative celebration that raises awareness of the strong craft beer industry while promoting patronage at local establishments and energizing the region’s retail economy. Many more events will be announced in the next few weeks. Flagship event tickets are on sale now! Don’t wait, don’t lose out! Buy your tickets now!! Check out the Cleveland Beer Week Website for Brewzilla, Grains vs Grapes & more tix!